The term agroforestry is derived from agriculture and forestry and represents the combination of both. Through the integration of trees on farmland, increased social economic and environmental benefits are realized. 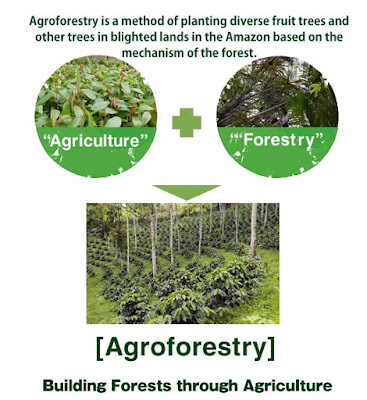 There are three main classifications of agroforestry systems. Agrosilvopastoral system gathers trees, crops, and animals together. In conventional agriculture, removing trees is a common practice. This principally effects hills and valleys leading to severe erosion. Trees on farmlands can have a variety of positive effects on both crops and animals. As their roots extend much deeper than those of annual crops or pastures, water can more easily infiltrate into the ground which leads to reduced waterlogging and runoff. As a result, erosion rates are significantly reduced. Trees also take up nutrients in deeper layers that cannot be reached by the crops and thereby prevent the leakage of fertilizers or manure into the groundwater. The canopies of the trees serve as windbreaks which lowers the evaporation of the surrounding vegetation and act as a shelter for increased animal welfare. The inclusion of trees in agriculture enhances biodiversity and helps with biological pest control by attracting birds that feed on caterpillars for instance. Trees can diversify a farmer's income sources. They can provide fodder for livestock food such as fruit and nuts, firewood and timber. In contrast to annual crops, trees in general have a much slower race of income return. They may take several years before they start paying off. This is a big obstacle especially for farmers that do not own land but only rent it. Agricultural policies often discourage farmers from adopting agroforestry systems by not providing any subsidies, while conventional monoculture systems are promoted. Forest regulations might even prohibit the selling of tree products grown on farmland. Although not as profitable as conventional agriculture at a first glance, agroforestry comes with long term benefits such as preserving forests, cleaner waterbeds, healthy biodiversity and a sustainable and profitable relationship between the farmer and the environment. In economic terms, agroforestry has an advantage over conventional methods of horticulture and forestry and horticulture, as this method combines long-term yields with short-term returns from crops, livestock and other forest products. In these pros, agroforestry is able to leverage short-term cash flow over time more effectively, making the entire operation systems more profitable than when the agro and the forestry components are separated. Many researches shows crop yields in fields that are adjacent to shelterbelts have increased. These increases due to the better snow (moisture) retention techniques and improved microclimates used, which can control or reduce climatic effects nad wind speeds that lessen damage to crops. By combining proper tree species selection, good shelterbelt maintenance and responsive crops, shelterbelts can be expected to improve crop yields and increase profits. Generally, tall, long-lived trees planted in rows perpendicular to prevailing winds combined with narrow fields can be expected to provide the greatest yield increases. Historically farmlands have been planted trees to conserve energy, and across fields to help conserve soil and water. Heat loss through infiltration and conduction is a common problem faced by farmers every winter. But thanks to shelterbelts in agroforestry, the amount of energy needed to heat confinement buildings will be reduced. Aside from conserving energy, soil and water, farmers plant trees around in their farms to try and conserve wildlife through diversity. Farmlands that were converted for settlements, which dramatically reduced wildlife habitat, can be reverted to make up for the loss by planting crops. After all, this action is not only good for the landowners and the wildlife, but also for the environment as a whole. Agroforestry helps realize a number of ecosystem services. Field shelterbelts can be highly effective for preventing and controlling soil against erosion and water-logging. Shelterbelt plantings on agricultural land to protect crops and soil, catch and distribute snow, minimize evaporation of water from soil and plants by decreasing wind speed, and improve the micro-climate for crops growing in their shelter. A shelterbelt must be designed to perform its main function with optimum effectiveness that can protect deeper and more extensive root systems. The establishment of agroforestry on farmland comes with certain challenges. And the biggest disadvantage of agroforestry is the huge amount of time required to reap the yield products. As we can see, this is often the first challenge for agroforestry, where it always involves integrating long-lived perennial crops or trees with other plants and livestock. Usually, planting to harvest crops, even the fast-growing species, can take many years. Another big issue with this method is in managing the land in question. Because it involves diverse use, daily farming problems are far more complex compared with those in monoculture farms and straight forestry operations. Aside from this, agroforests often see that farm machinery would be more difficult to utilize in a confined forest space. For the solution, the trees are spaced to allow farming machinery access to the rows with the planting spaced to fit the machinery. Simply put, agroforestry is not the best solution to the issues in agriculture, as no farming system is optimal for every farmer, situation and condition. However, when agroforestry works, it will certainly work well, but it can also fail miserably when applied to the wrong situation. This is why it is important to assess its advantages and disadvantages first before implementing to use this agroforesty method to your farmlands. 0 Response to "Advantages and Disadvantages of Agroforestry"